Time-limited notices (e.g. work party and fieldtrip announcements) will be removed from this page after the date of the event. Items of more general interest (e.g. ringing recoveries) will be retained for a longer period of time. If you have a news snippet item, please send an email to the web manager. To read an obituary for our late President, Frank Gribble, please select this link. BirdTrack is an online bird records database, delivered through a partnership between the BTO, the RSPB, Birdwatch Ireland, the Scottish Ornithologists’ Club and the Welsh Ornithological Society, that looks at migration movements and distributions of birds throughout Britain and Ireland. This database provides facilities for observers to store and manage their own personal records as well as using these records to support species conservation at local, regional, national and international scales. The Shropshire Ornithological Society maintains its own electronic database of records (using ‘Recorder 6’). It is down to the County Bird Recorder to ensure that this includes as many validated records from within Shropshire as possible. This database is the only official record of the birds observed within the County. 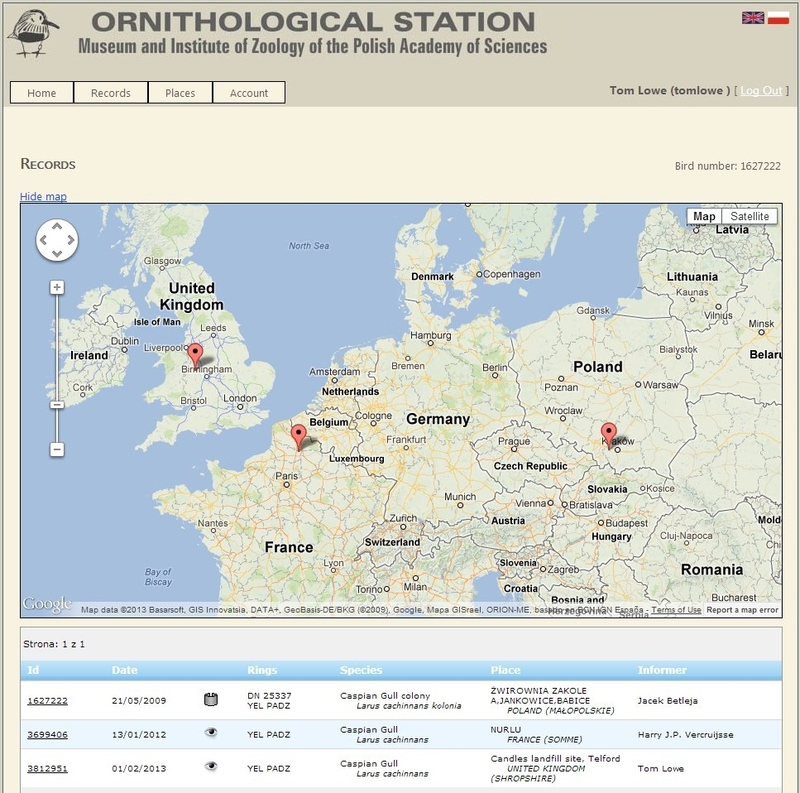 The SOS promotes the use of BirdTrack for the submission of records. It is a powerful and simple to use an online system or ‘phone application (‘app’) that allows users to upload partial or complete lists for the sites they visit. The County Recorder has access to these records, and will download all records uploaded to BirdTrack on at least a quarterly basis, with all BirdTrack records used in the summary of observations within The Buzzard, and in the Annual Report. Allow access: When setting up you user account, it is imperative that you tick the box to ‘allow recorders to access your records’. If you have set up an account and are not sure if you ticked this box, log in to your account and click ‘my details & settings’, at the bottom of this section. It hopefully states that ‘you have asked us to forward records to local recorders’. If not, please email web.support@bto.org with your user_id and a request to change this setting. Create lists for specific sites: If you are recording the species you see during a walk, rather than create a single list for the length of your walk, create smaller lists for the areas visited (and name them appropriately with the correct Grid Reference). For example, if you were to walk along the River Severn from Bridgnorth to Highley, create a number of lists along the way e.g. ‘River Severn, Bridgnorth’, ‘River Severn, Quatford’, ‘River Severn, Hampton Loade’, ‘River Severn, Highley’ etc. This ensures that the records are entered at the correct location (albeit an approximate location); a list of species from a ten-mile walk is of much less use. Name sites correctly: Name the sites you visit based on the names on the OS maps so far as possible. Avoid the use terms such as Garden List, Work List etc. Ensure the site Grid Reference is correct: When creating a list for a site for the first time, make sure the grid reference is correct. This is particularly relevant when using the BirdTrack app as it is possible to create a new site, which if you are not at that site, will use your current Grid Reference. Do not duplicate records: If you submit your records through BirdTrack, there is no need to send them to the County Recorder by any other means. Include comments: The number of records submitted to BirdTrack within Shropshire increases each quarter. There is the temptation to create lists of species and numbers with little additional information, as these lists are often generated on ‘phones in the field. But, the Annual Reports will become very boring if they become simply a list of species and numbers by site. Include relevant comments on noteworthy behaviours, breeding activity, habitat preference etc. when possible. A Lapwing photographed at Venus Pool on 30 August 2015 had been ringed at Sealand Manor, Flintshire on 1 May 2003. Surveying Churches and Chapels for Swifts by Peta Sams. Please see here. Canada Goose “red AAJL” was ringed at Bowness on Windermere on 2/7/13, then seen at Polemere on 22/9/13, now nesting on Long Mynd. Caring for God’s Acre Needs YOU to Find Swifts in Churches! Caring for God’s Acre is a conservation charity dedicated to wildlife and conservation within burial grounds of all faiths, denominations or non-faith sites. We seek to encourage people to manage these fantastic places with nature in mind as well as learning about them and enjoying the tranquillity, wildlife and history that pervades most burial sites. We aim to encourage, support and influence, working closely with site managers, diocese staff, council staff who manage cemeteries and also conservation charities such as Swift Conservation. We run conferences, workshops and skills training for burial ground managers (usually churchyard volunteers) and have considerable resources on our website (www.caringforgodsacre.org.uk). This includes Case Studies, an Education Pack aimed at children up to about 11 years old, an Action Pack, a Botanical Companion and will include a Field Studies Council fold-out chart (currently in preparation). We have been working with Peta Sams of the Shropshire Swift Group and through this have become aware how difficult it can be to identify and protect Swift nest sites when the birds are not present. To help protect these sites we are planning a survey of Shropshire churches and chapels and are asking SOS members to help. This survey will involve observations in the evening when Swifts are likely to be returning to nests in the months of May, June and July. Caring for God’s Acre will hold this information in a database and will use it to inform diocese staff and also local vicars, churchwardens and Parochial Church Councils that they have Swifts. This database will be invaluable to diocese staff when building work is needed and Swift Conservation can then advise on how best to protect both nests and birds. We hope this will be a pilot which, in time, could be followed in other dioceses. Churchyards and cemeteries are also known for providing good habitat for Spotted Flycatcher and we would like to hear about of any records specific to burial grounds. Presence would be useful and breeding records great. We would be collating this for awareness raising and possible interpretation. If you are interested in contributing to this survey then please let me know. It has been approved by the SOS sub-committee and I will set out a more detailed system for recording in the spring. Sad news from the BTO, an adult male Turtle Dove ringed near Shrewsbury 21 May 2008, has been found shot dead in Spain on 19 Sep 2014, 1500km due south. The colour-ringed Little Egret that has been at Venus Pool this autumn was rung as a nestling on 10 June 2013 at North Cotes, Lincolnshire. Venus Pool is a distance of 203km from the ringing site. Mediterranean Gulls have bred at Wood Lane NR, successfully raising three young. This is the first known breeding of this species in Shropshire. The chicks hatched at the end of May and have recently fledged. More than 30 Coot have been colour-ringed on the Mere at Ellesmere in the last three years, along with several hundred more in Lancashire and further afield. The main colour ringing scheme uses a white colour ring with three letters in black on the left leg, as shown in the images here. Other Coot ringing projects exist so it’s possible that you may see a bird wearing two or more colour rings, with or without lettering. So far the only reported movement is a bird seen on the Mere that was originally ringed in east Cheshire, but Lancashire’s experience suggests that Coot move around the country far more readily than might be expected. If you happen to see a colour-ringed Coot on the Mere or anywhere else it would be greatly appreciated if you could make a note or take a picture of the ring colour and letters (or the combination of colour rings on each leg if appropriate) and report it using the website www.ring.ac All reports will be acknowledged and the original date and place of ringing advised whenever possible. We hope to colour ring more Coot on the Mere over the next few months and, if spring ever breaks, at least some of them may disperse within the county or further afield, so it will be interesting to see where they turn up. The sensible ones have probably flown south for a few weeks! As a slightly more glamorous example of the sort of discovery that can be made by reporting colour rings, one of the Waxwings that were colour-ringed in Newtown before Christmas has been reported in Lewes (Sussex) and more recently near Geneva, the first ever UK ringed Waxwing to be reported from Switzerland! More info here. On 1st February 2013 there were three Caspian Gulls present at Candles Landfill in Telford: an adult that has been present on and off since 30th November, a 1st-winter that was first seen on 27th December, and a new adult. The latter was seen to possess a yellow ring, and a review of a still image from video footage taken at the time enabled the letters “PADZ” to be read. This new adult brings the total number of Caspian Gulls recorded at Candles this winter to an impressive 10, and is thought to be the first ringed individual recorded in the county. There are eight Community Wildlife Groups, which between them cover most of the Shropshire Hills. All are doing bird surveys, and would welcome the involvement of other birdwatchers. Population decline, its small size and habit of spending much of its time high in tree tops, means the Lesser Spotted Woodpecker is rarely recorded in Shropshire. Only a handful are actually caught and ringed in the UK each year. Pete Deans first caught a Lesser Spotted Woodpecker in his Shropshire garden on the 12/10/2010 as a first year female. It was caught for a second time on the 15/08/2012. Then caught again on 15/01/2013. Why ‘No Dogs’ at Venus Pool?